Fukuroda Falls (袋田の滝, fukurodanotaki) is one of the three great falls in Japan, and also one of the 100 best waterfalls in Japan. This falls has four faces for each season. In Autumn, there is beautiful Autumn Leaves. There is new observation stand for high angle. 300 yen for observation deck. There are many parking, restaurants and gift shops around the fall. On September 2008, the new observation deck will open. This fall is also know as four times falls because it has four steps, but also one of the priest Seigyo said once "You have to visit four times to see all beautiful faces of this falls." 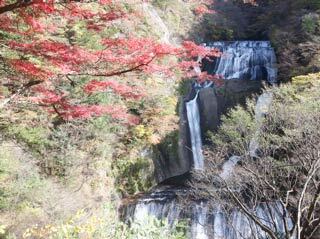 In 1992, Fukuroda falls was chosen as the best waterfalls in Japan. In the winter, the fall will be frozen up, and some people enjoy ice climbing. It is the huge waterfalls. There are many hot spring around this falls. So, Checking out the best waterfalls in Japan, eatting great food around, and enjoying hot spring will be a great combination for excellent tour you can have in northern Kanto.